A warm and delicious blend of dark chocolate and red wine. For the ganache: In a medium pan over medium-high heat, bring the cream to a boil. Place chocolate in a medium glass bowl and cover with boiling cream. Let sit for 5 minutes, or until the chocolate has softened. Using a spatula carefully stir the chocolate and cream until fully combined. Stir in wine, and butter and stir until fully incorporated. Cover and place in refrigerator for at least 24 hours, or until ganache has become firm. For the red wine reduction: Place wine and sugar in a small sauce pan, bring to a boil and reduce until a syrupy consistency is achieved, about 10 to 15 minutes. Reserve. For the cake: Preheat oven to 375˚. Coat 12 4-ounce ramekins with cooking spray. In a large bowl, combine cake mix, wine, eggs, water and oil and beat together with an electric hand mixer. Fill each ramekin 1/3 of the way with cake batter, top with 1 tablespoon of firm ganache in the center and fill with cake batter to just below the lip of the ramekin. Bake for 15 minutes, or until the edges of the cake are firm and the center is not fully set. 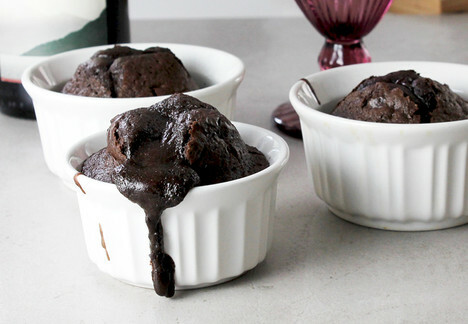 Allow cakes to cool for 5 minutes, top with red wine reduction and serve.